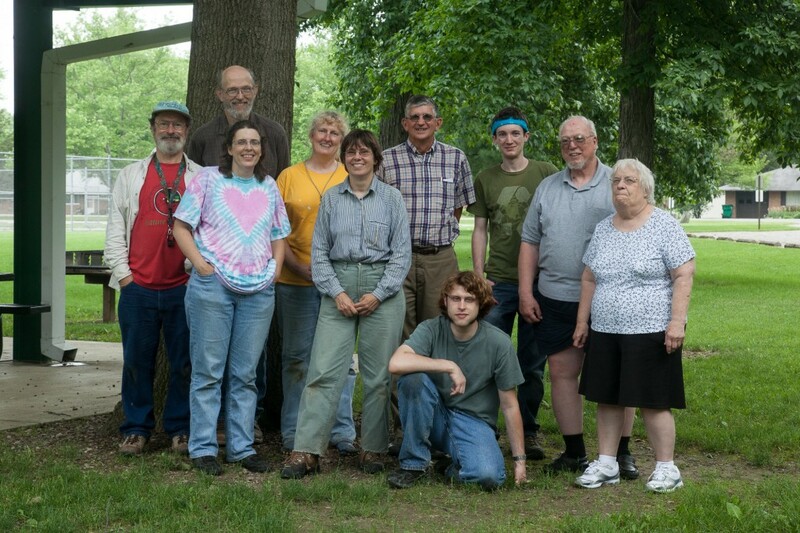 The Spring 2011 foray of the Ohio Moss and Lichen Association, organized by Jim Toppin and Janet Traub, was conducted in Defiance County, in northwestern Ohio. Prior to this outing, only 15 moss species and 25 lichen species were reported for county where there there had not been much collecting in the past. Defiance County in northwest Ohio is just over 400 square miles. The county is primarily farmland (80%), with about 12% forest and just under 4% wetlands. The foray was attended by10 people, including one who was new to the group. We began the day at Thoreau Wildlife Sanctuary located northwest of the city of Defiance. This 200-acre sanctuary was established by the Diehl Family Foundation in 1989 and is used by Defiance College for restoration ecology research and education. The sanctuary covers about 200 acres, of which 100 are wooded. We were met there by Defiance College Biology Professor Doug Kane, who graciously provided an orientation to the site. 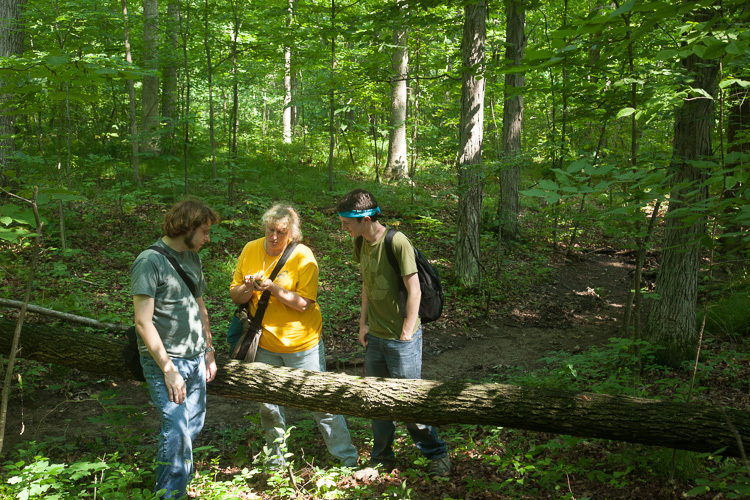 Cynthia, Jeff and Logan ponder cryptogams on coarse woody debris at Thoreau Sanctuary. W also collected at Penney Nature Center, a 78-acre tract locate a few miles north of the Thoreau Sanctuary, and like Thoreau, consists primarily of mesic woods mesic sites with small wetlands. We had lunch at Bronson Park, a 25-acre city park on the south side of Defiance along the Auglaize River. In the afternoon we collected at a privately owned woodland in the southeast part of the county. This had some extensive wet areas. A total of 41 lichen species were recorded, of which 25 were new to Defiance County. Many of these were located in area cemeteries, which were surveyed by Don Flenniken. Species lists and additional details about the OMLA Spring Foray are in the 2011 OBELISK newsletter. 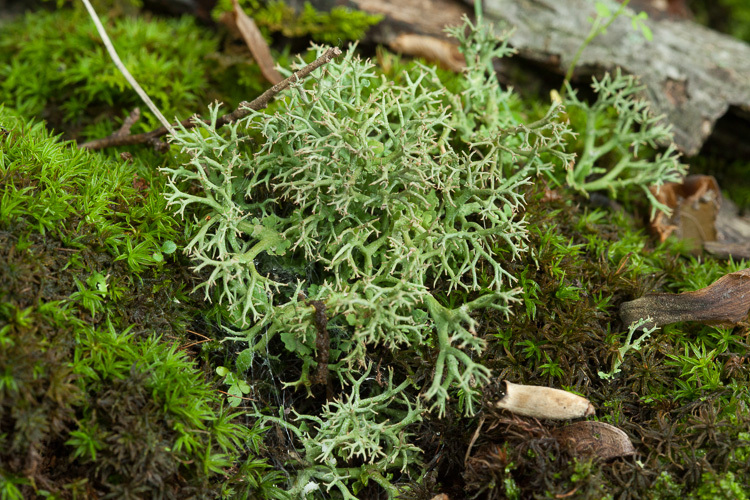 Fruticose lichen at Thoreau Sanctuary, Defiance County, Ohio. June 11, 2011. 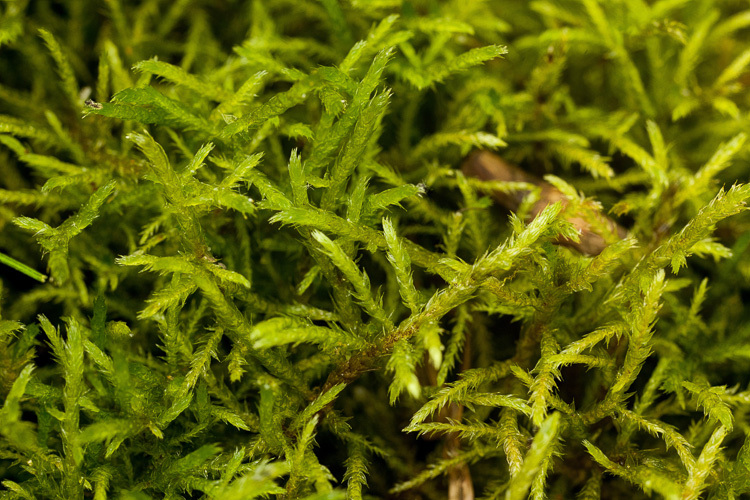 We found 44 moss species, all of which were new county records. An erect pleurocarp that grows in tufts in wet calcareous soil.